Although this menu is active in all states, but it’s really important only in Analysis state. We can use this menu to display cables and check that all is well in for finding and patterning, but it is not essential. The edit cable menu displays a window in tabular form with a series of buttons at the top. It indicates whether it is a boltrope (border) or a guyrope (external). Total length of the cable in m. If it is a boltrope, it is the sum of all the lengths of the bars that form it. If it’s a guyrope, it matches the length of the bar. Cable axial force in t.
It is the cable code as defined in the database of cables. Numbers of bars that make up the cable. If the bars are contiguous (consecutive numbers of bars), it can be generated automatically by the Setup button. Value that indicates if the stress exceeds the value of permissible cable stress taking safety factor into account. The permissible maximum value is 1. If this value is exceeded the box in this column appears in red. If the box is close to zero or zero, it is blank and in other cases it is in green. Clicking on any box of column 5 opens a drop-down menu that lets us change the type of cable by any other that is in the database. Clicking on any square of the column 6 makes it editable and we can manually modify the bars forming the cable. If the bars of this box does not form a set of correlative bars (no matter their numbering), we get an error when trying to save the data. Everything on the table including all the changes we have made will be stored in the structure and edit window will close. This is a drastic operation: removes all cables of the structure (not the bars!) and re-define. For each cable, a search is performed in the database in an ordered (*) way to find the cable which gives a ratio < 1. This button is very useful when you have made changes to the structure and have been added or deleted cables. It must not be used when we are in a state of analysis in which we have already decided what cable of the database we will use for every cable of the structure, since everything previously selected will probably be modified. WARNING: This action is canceled by touching the Cancel button. (*) NOTA: This rule is very important, because it requires setting up a database with an order of preferences as WinTess3 always starts with the first cable of the database and will be looking for from the following to find the one that serves your needs. If there is a cable of less resistance capacity behind another of greater capacity, the first one will never be chosen automatically, although obviously we can choose it manually. This is the most helpful button in the Analysis state, since it modifies only the cables that are not strong enough. How a new cable is chosen has been commented in the previous Setup paragraph. Anyway it is necessary to verify what changes it has realized, since there are times in which we want two cables to be the same for aesthetic reasons or for symmetry reasons in another load combination or for any other reason, and on the other hand the program may suggest different cables since it always proposes the minimums that support the current loads. Clicking this button displays a message informing us that to remove a cable just click on the cable number (column 1). If we click for the second time on the deleted cable number, the removed cable reappears. With this option, we can directly create cables from the bars on the mesh. Pressing this button creates a new cable and highlights the box of the bars that form the cable. We can enter these bars manually or through the mouse by clicking on the mesh or through a window to select several bars at a time. Once completed the selection, press the right mouse button and choose the type of cable. Using this button, we can modify the safety factor of cables. By default, the assigned value is 3. In case of a steel cable, it is possible that there is some legislation on the subject. However the majority of rules affect more industrial cables than cables in architecture, therefore it will be the user who should choose the safety factor that is to be applied. F = 3 when we are using steel cables with normal terminals. F = 1, 65 if the cables with terminals have been tested to working loads. Intermediate values can be used depending on the confidence that we have in the cable manufacturer and their terminals. The modified value is saved by the program in the user preferences file until a new modification. The cable edit window is closed and none of the changes are saved. Everything related to the cables database has already been mentioned in the Introduction – Cables section in this manual. Cable (steel): generally a cable formed by wires or fibres smaller than the cable, braided between them. 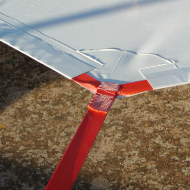 Webbing: Tape-shaped element (wide and not thick) that is usually formed by synthetic fibres. 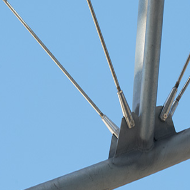 Rod (steel): usually of high strength steel, more economical than a cable (steel). Then, in the Material drop-down box, we choose the material that forms the cable and, if necessary, another drop-down box appears to the right of the cable material to determine the cable subtype. Below we have three values: Modulus of Elasticity, Breaking Load and Density. These values ​​are automatically filled in, but you can change them if you wish. If it is a new material, these values ​​are blank and must be entered by the user.In the lower part we have the cable Code. It is a text that defines the cable type, and can be anything. The user must define in the end the name that is proposed to the cable. There are also two buttons to decide whether the cable type is inserted: at the beginning or at the end of the database. Once everything is complete, we can Save into the database or Cancel the operation.